# Pairs of files generated by the same build rule. Deleting primary custom command output "/build/mapserver/build/mapscript/python/mapscriptPYTHON_wrap.c" because another output "/build/mapserver/build/mapscript/python/mapscriptng.py" does not exist. @AlexanderGabriel - maybe you have an idea on what causes this? sure, you are in the right branch? However... The code there should not be parsed if SWIGPHP is not defined and it should not cause a rebuild everey time. I renamed swig based mapscript to mapscriptng to be able to load both modules at the same time and to make visible that this extension is not the old one. But i did not test this. Did you try with a newer SWIG? @AlexanderGabriel - thanks for the reply. The code looks fine to me with the #ifdef in mapscript.i but it generates an incorrect build target. It could well be some CMake/SWIG issue/bug. Apparently SWIG implements some of the C pre-processor functionality, but is not the preprocessor. Also %module% has to be at the top of the file (but I've seen examples on GitHub also using #ifdef. The pull request #5709 is based on master so should have all the latest PHP changes. My change at 4bfd0c5 gets rid of the incorrect build rule, but likely breaks the PHPNG MapScript build. Travis builds correctly - https://travis-ci.org/mapserver/mapserver/builds/459243895 and uses cmake version 3.9.2, however it has * PHPNG: disabled - should these be run normally? I'm using cmake 3.10.2 on Ubuntu where the error occurs. I'll give the ifdef and ifndef suggestion above a try, and also see if the same issue happens on Windows. 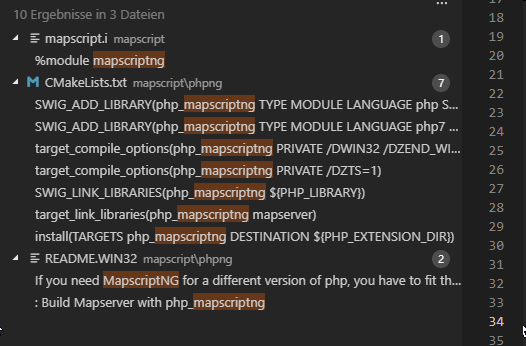 removing the entire contents of mapscript/phpng/CMakeLists.txt has no effect (issue remains), so I guess that rules out any command in there (same for /build/mapserver/mapscript/php/CMakeLists.txt). If you get a chance maybe you could confirm the issue exists in your setup? Build with DWITH_PYTHON=ON and DWITH_PHPNG=OFF, and see if grep -iRl "mapscriptng" ./ returns any files? This may well break the PHPNG module name though. Tested on my machine, could compile extension and load it, could create a mapObj and access properties. Looks good to me. Nothing broken. @AlexanderGabriel - thanks for testing. I'll apply this update then if it is ok with you. Quick question - if you run make twice does it rebuild the PHPNG module, even though it is built already? That was the main issue with the Python MapScript bindings - they were build every time, including on make install.